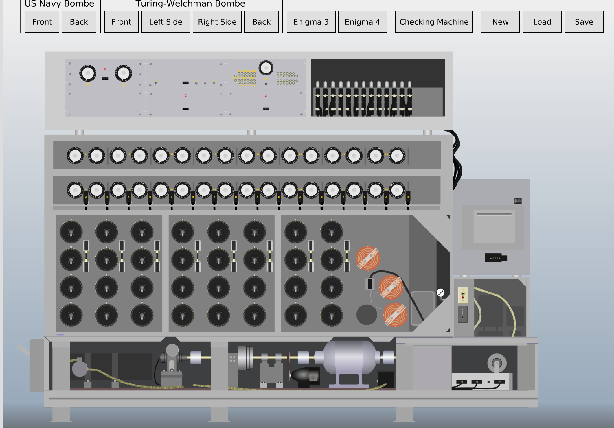 In World War II, British codebreakers in Bletchley Park constructed a machine that could decipher Enigma messages: the Bombe (also known as the Turing Bombe or the Turing Welchman Bombe). The Bombe was a development from a device that had been designed by Polish mathematician Marian Rejewski, known as the “bomba”. 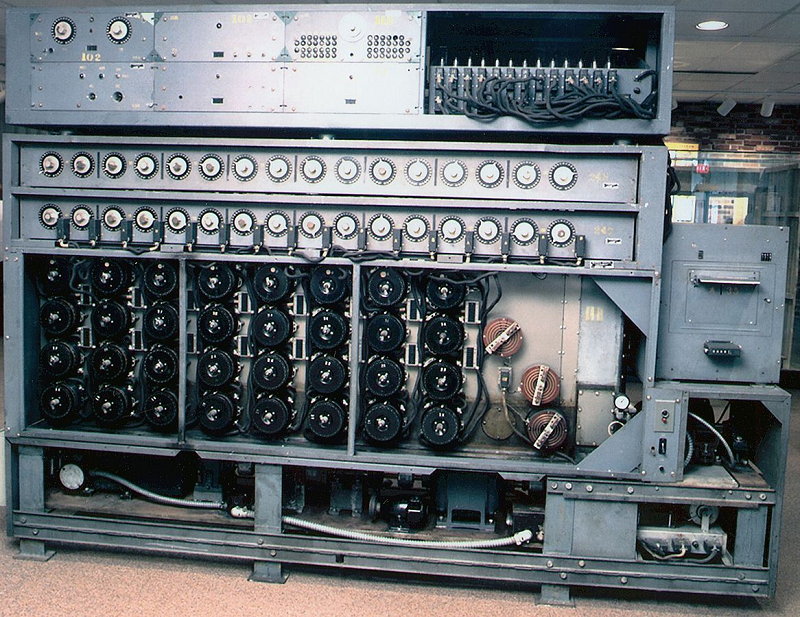 Using the bomba and other machines, the Polish had been breaking German Enigma messages in the 1930s. The initial Bombe design was developed by Alan Turing in 1939, with an important refinement devised by Gordon Welchman in 1940. 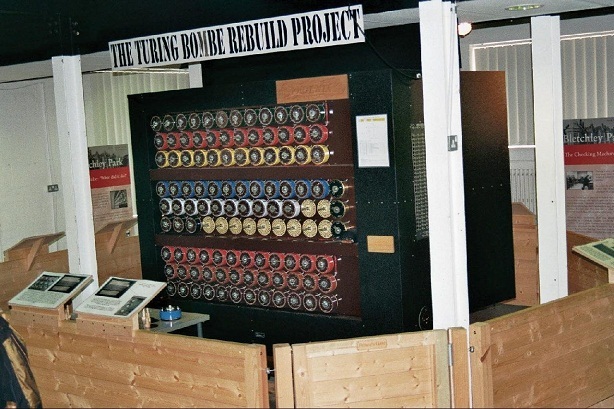 Over 200 copies of the Bombe were built. After the war all of them were dismantled (at least that’s the official story). From 1994 to 2007 a team of volunteers at Bletchley Park created a rebuild, which is today on display at the National Museum of Computing (a museum located next to the Bletchley Park estate). There was also a US version of the Bombe (also known as “Desch Bombe” for its constructor Joseph Desch). 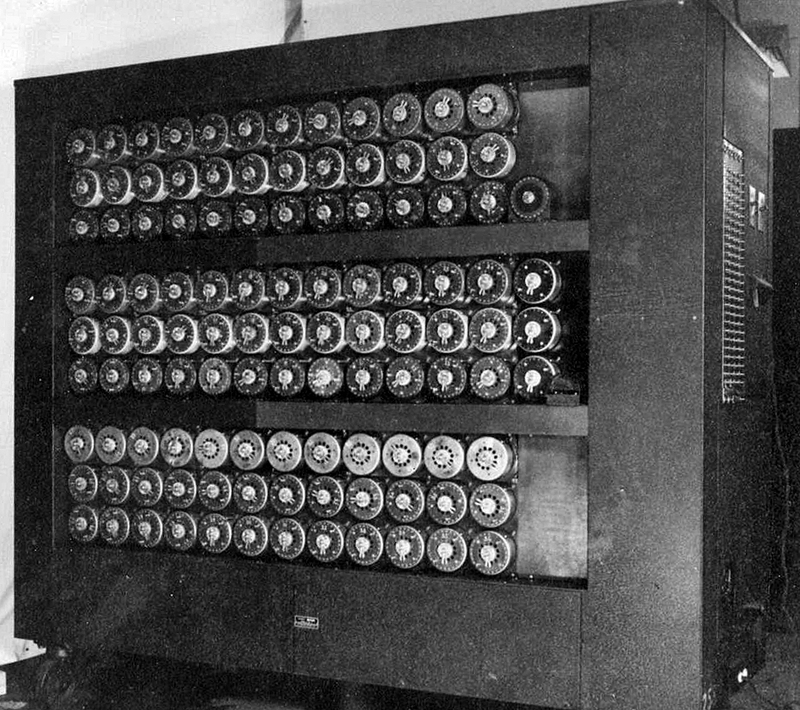 The US Bombe was made to attack the four-rotor naval Enigma. An original of this machine is on display at the NSA Crypto Museum in fort Meade near Washington. … and the US Bombe. Apparently, George has deciphered nine challenges over the last few days. Congratulations! Apparently, challenge 4b is still unsolved. So, there is at least one chance left to add your name to the winners list. And then, you still have the chance to be second or third at a few other challenges. Good luck! Those are great challenges. The first ones can be solved using the simulator on the site, and this is a highly enjoyable process. And a good opportunity to experience working with a bombe, which is very well documented. 4b is really tough. No success so far, despite many attempts. 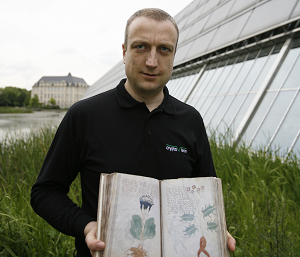 But I have no doubt that the Enigma experts in this forum will be able to break it very soon. Thank you Klaus and George! I would like to mention that the challenges have been made by Vali Popa. 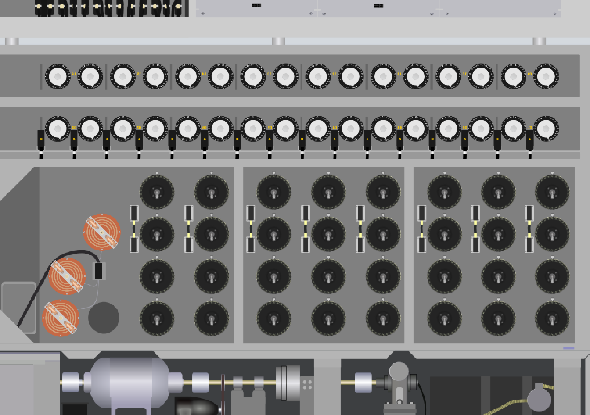 If there are any questions related to the simulator just post a comment here on the blog and I will try to answer. Those challenges not created by the solvers :-). And only the first ones can be solved with the simulator. The others require additional techniques. There are 3 new M4 challenges. Unsolved. Thanks for your comment at #6. It seems I joined the party just in time — I see that we both found the solution to message 4b on the same day. 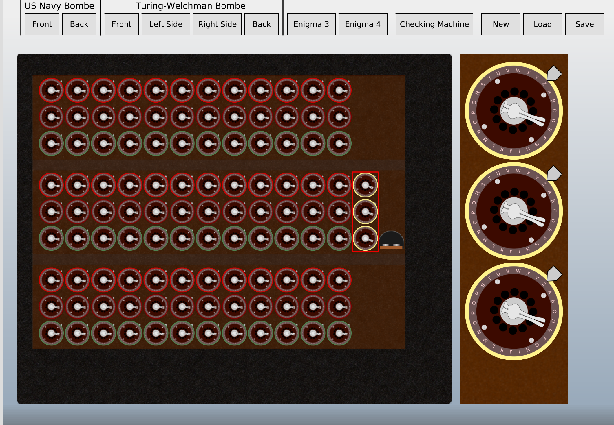 I had tried the simulator of the British bombe a year or two ago, but I hadn’t visited the website in some time, so I was not aware of the update and the addition of the US bombe simulator. Thanks for telling Klaus about this, and thanks to Klaus for passing the information along to the rest of us. Did you see there are 3 new M4 challenges (4c, 4d, 4e)? I was not able to solve them. PS: What programming language are you using for your Bombe? M4 challenges take more time if there are turnovers of the two middle rotors. My program (Java) is a little slow. I’ve solved 4c, I haven’t yet looked at 4d, and I’ve been trying 4e, but so far without success. I’m using C++ (in Microsoft Visual C++ 2010 Express). It’s the only programming language I know, and I don’t really know it all that well — I’ve only learned just enough to be able to write my amateur codebreaking programs. Thanks for the details. Your work on Enigma is quite impressive. I like a lot your papers too. They read like a detective story. I am taking a pause with the Enigma challenges, as I have other projects on my plate. Will come back to them later. 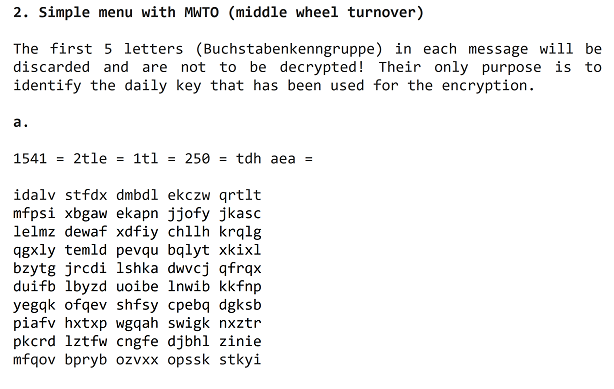 there are more Enigma challenges, some quite cool. A few unsolved. There are challenges for other machines if you are interested.